Home 30 Days Wild Dr M’s 30 Days Wild 2016! 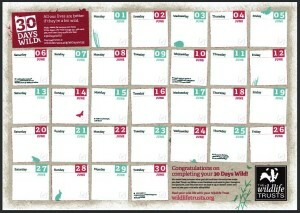 Furthermore, they are again encouraging Random Acts of Wildness – bitesize bits of wild inspiration, for which in return they are offering a beautiful badge, funky stickers and a gorgeous wallchart! Dr M says: What more could you possibly want, let’s hope this encourages shed loads of parents and children to take part and continue beyond June into the rest of their lives! Day 30: The final day of going wild finds Dr M contemplating some yellow clover-like plants at the trampled edge of a grassy bank. So, are they clovers? And if so which one? Is there more than one? 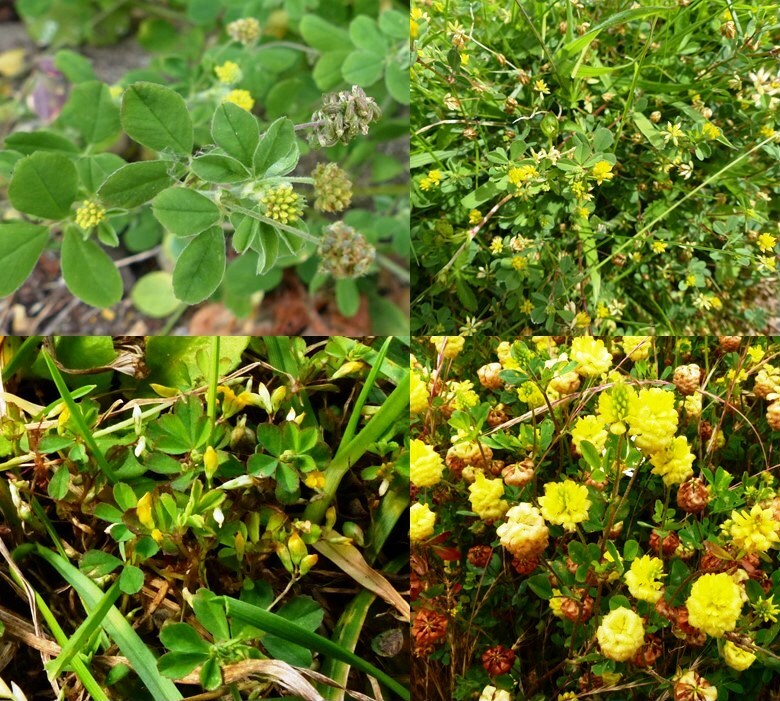 Have a look at the image, can you identify these yellow clover-like plants? Check out more in Dr M’s yellow clover post here. Day 29: For the penultimate day of his 30 Days Wild Dr M was struck once again by the beauty of common plants. This time is was Prunella vulgaris (Selfheal) growing on the University of reading campus. Dr M has for a long time had a soft spot for Selfheal and it is a little know botanical fact that Dr M studied the growth and reproductive allocation in this plant for his BSc Honours project at Bangor University a lifetime ago! 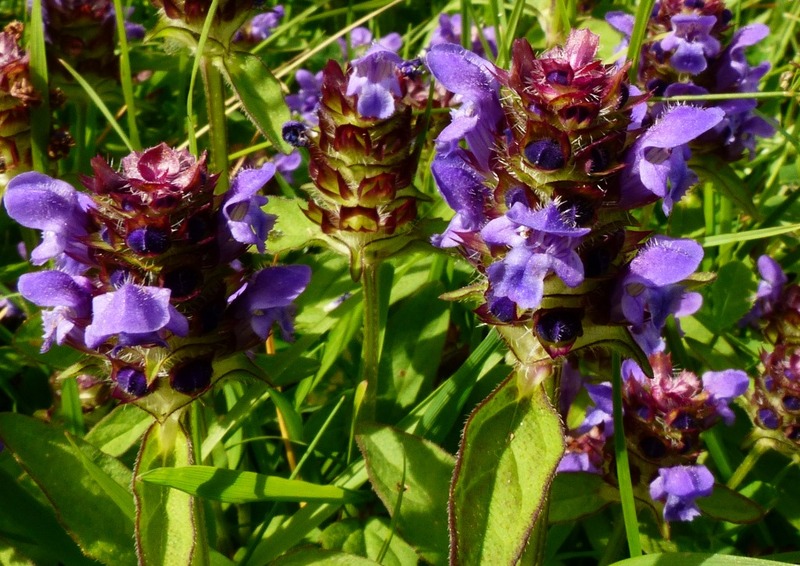 As well as a beautiful grassland plant, Selfheal has a long history of medicinal use, and traditionally the leaves are applied to wounds to promote healing. 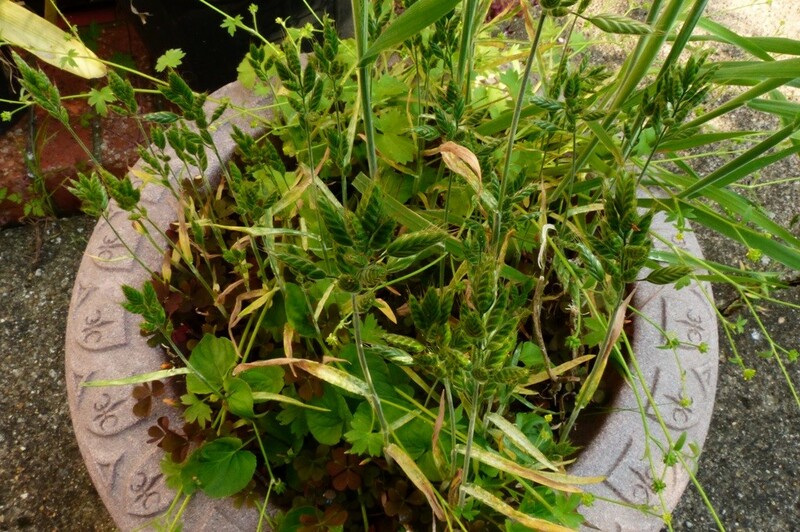 The 16th-century herbalist John Gerard said, “there is not a better wounde herbe in the world“. And the 17th-century botanist Nicholas Culpeper wrote that the plant is called selfheal because “when you are hurt, you may heal yourself“. In the past it has been used to staunch bleeding and for treating sore throats, mouth ulcers and heart disease. In Chinese medicine it is used for treating liver complaints, acting as a stimulant in the liver and gall bladder and even as an anti-cancer drug. Find out more at the Kew Science ethnobotany webpage here. Day 28: Finds Dr M back on the University of Reading campus and an encounter with this lovely show of Field Scabious (Knautia arvensis) in the teasel family Dipscaceae with dainty, lilac blooms that bob on the end of long stalks, and a common sight on hedge banks in mid to late summer..
Field Scabious has a rough, hairy stem what we might call hispid and its a bit like rough scabby skin and this was probably the reason it has been used to treat scabies, mange and itches – the ‘scabiosa herba‘ (hence the common name). Day 27: Finds Dr M at the Gatsby Plants Summer School at a rather idyllic retreat at Hawkhills Centre near York. As Dr M has reported already here, the Gatsby Plants Summer School is a unique opportunity for first year BSc students to discover the challenges and opportunities of studying plant science, through talks from leading scientists, careers sessions, practicals and discussions with researchers and peers. During the day that Dr M attended in addition to the main programme of talks there were a set of practical sessions and Dr M was wowed by a brilliant plant ID practical run by Dr John Milne and colleagues from University of Edinburgh. The study room with quite literally filled with nearly 100 different plants beautifully fresh and flowering and arranged in vases – actually, and appropriately for a science meeting, these were laboratory measuring cylinders! The focus of the practical was on learning to identify plant families and students were introduced to an original schema, devised by Richard, for identifying common plant families from some basic characters like flower and inflorescence structure. The task for students was to use the scheme to get to family and ID books to get to genus and species (the two used were the classic illustrated wild flower guide by Keble Martin and David Streeter’s Collins Wild Flower Guide). The student getting the most correct answers in the set time was the winner of sweet treats! But of course it was not the winning but the taking part which was central, and the whole event was vibrant with botanical beauty and Dr M was delighted to see so many students immersed and enthused and going wild with the task of serious plant identification! Day 26: ‘Tis Dr M’s niece Eleanor’s birthday, and to celebrate there was a family gathering at Grandma’s house during which Dr M sent the kids wild with a wild strawberry hunt, easily won by Ellie with 84 individual fruits, soon demolished once the counting and award ceremony was out of the way! And then, borrowing Dr M’s camera, she set off around Grandma’s woodland garden to take photos, and returned with images of Hydrangea blooms and a rather stylish back-lit image of Acer palmatum as well as some hideous close-up shots of Dr M warts and all! 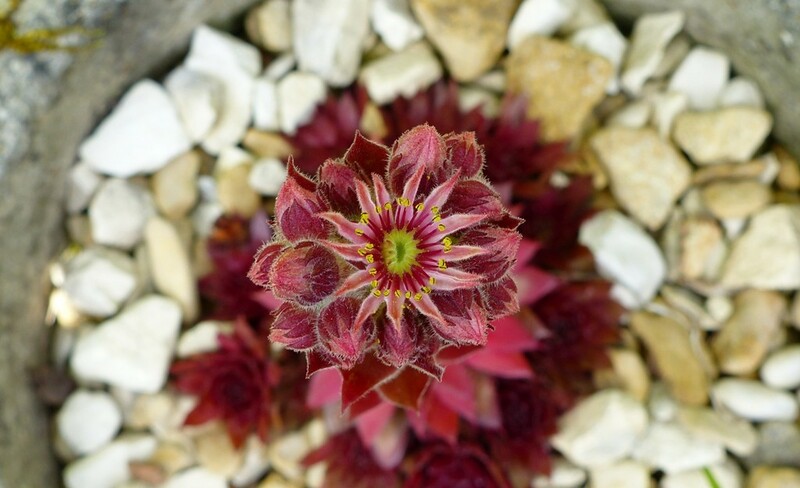 But in the end it was the symmetry and sheer Crassulacean beauty of this image of the House Leek – Sempervivum – which took Dr M’s eye, and here it is! 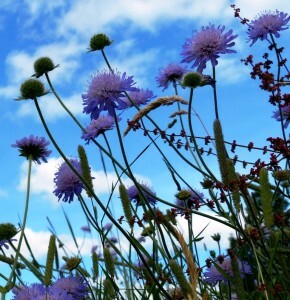 Day 25: Carduus nutans, the Nodding or Musk Thistle, has long been one of Dr Ms favourite thistles! Architectural in form and beautiful in the deep red-purple colour of the large globose nodding heads – technically the capitulum – with its acute, pointy and rather dangerous spiny phyllaries! This one was spotted by Dr M on a walk near Stonehenge and he and his students spent a few random moments admiring the industry of the bumble bees heaving their ways through the forest of florets no doubt in search of nectar and picking up a deal of pollen in the process! The music on the video is the Maid with the Flaxen Hair by Claude Debussy played by Richard Stoltzman with the Slovak Radio Symphony Orchestra. Day 24: A momentous day in which Dr M and millions of others awoke to discover that the UK has voted to leave the EU! Well at least 52% have voted leave and presumably are very happy with the result. For the other 48% there is much concern, disbelief and frustration! Referendums don’t come around very often and the results tend to be even more full and final that might previously have been imagined! Anyway, to relieve the tension Dr M and students decided to create a suitably botanical wheeze and thus the 52% leaves quiz was born! You can find it here test your skill at identify native, naturalised and garden plants from their leaves alone! Dr M says: By their leaves shall ye know them! quize seemed like Day 23: A momentous day during which the UK votes on whether to stay in the EU or to leave and for Dr M it was grassland survey punctuated by a visit back to Reading for Dr M to vote! 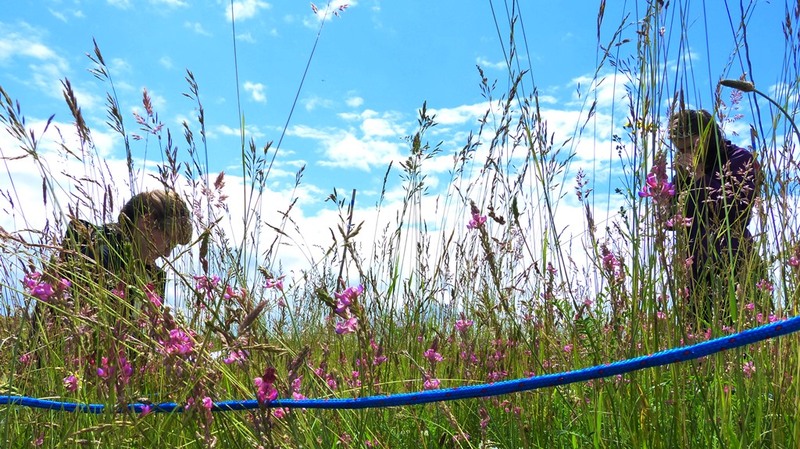 So, the grassland survey the aim is to see how the Stonehenge restoration grasslands have developed in terms of the UK National Vegetation Classification (NVC) types. To achieve this Dr M and students lay out 2 m x 2 m quadrats and check all plant species present in the quadrat and estimate the abundance of each species using the Domin scale. Dr M loves quadrat work, he could watch it for ages! Dr M says: Not familiar with the NVC? Well check Dr M’s intro here. And quadrats? Well check here for everything you ever wanted to know about quadrats and quadratting but were afraid to ask! 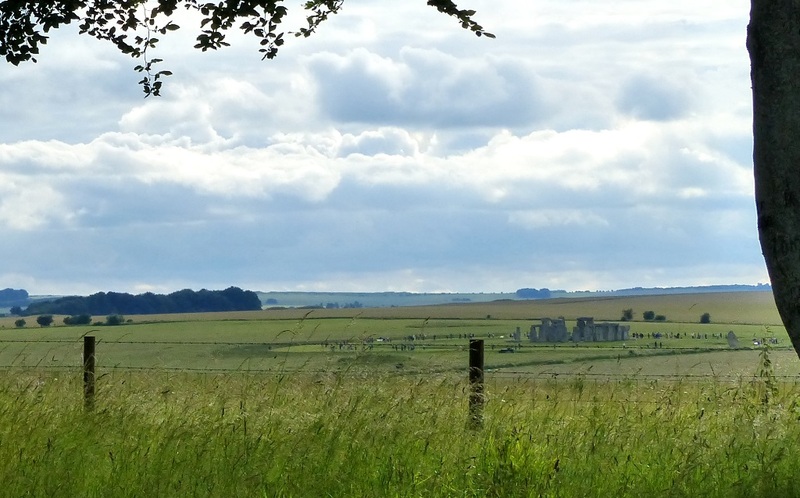 Day 22: Finds Dr M and a couple of his students arrived at Stonehenge World Heritage Site and admire this fine view of the stones from the nearby National Trust office. 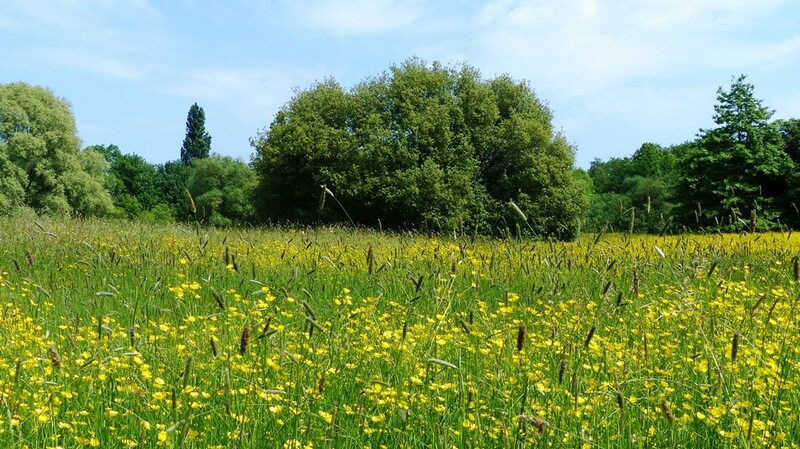 In 2000 the National Trust initiated a landscape restoration project with the aim of restoring species-rich grassland to some of the arable fields in the area and to return the landscape to something more like its original grassland context. There are now a number of ex-arable fields which have been sown with species-rich chalk grassland seed mixtures at various times between 2000 and 2013. Seeveral of Dr M’s students have surveyed the grasslands in the past to see how they are developing and whether they are showing any resemblance to the ancient chalk grassland in the surrounding Salisbury Plain Special Area of Conservation. The aim of this visit is to continue that work and to start up a University of Reading MSc Plant Diversity project with quadrat surveys of as many of the restoration grassland as possible. Day 21: Still near Stansted Airport and Dr M admired this lovely oak tree. With its upper branches erupting out of a gnarled base, all the twists and turns the result of past natural and human made events. Pollarding, storm damage and lightening strikes all history writ large in the structure and form of a tree! Day 20: While going wild carrying out some survey work near Stansted Airport Dr M was amazed at how much botany there is within a stones throw of the runway! Here is Bee Orchid (Ophrys apifera) looking lovely (surely one of our most photogenic orchids?) amongst grasses in a secluded meadow area! 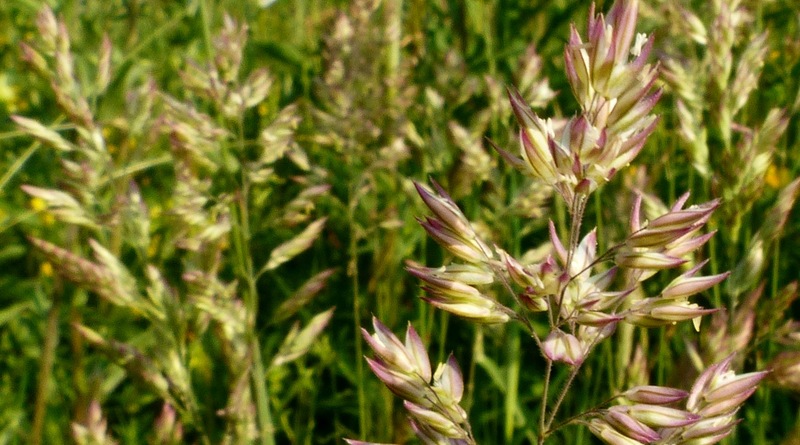 Day 19: Loveliest of grasses surely is the Holcus lanatus (Yorkshire fog). Known to grass aficionados for its soft velvety foliage and purple striped pyjamas, equally delightful are the flowers with large glumes (typical of the tribe Aveneae) and more purple stripes! 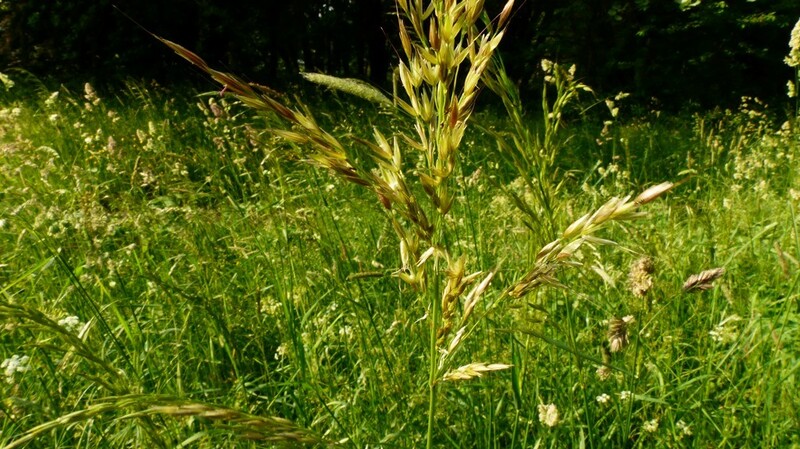 Check out Dr M Tribes of Grasses for the lowdown on this ubiquitous grass which amply demonstrates the beauty there is in even the commonest of plants! Day 18: Dr M visit his Mum’s woodland garden and says there is something about the foxglove he likes! A familiar and really attractive plant this, but there is rather more to foxgloves than meets the eye. Foxgloves, Digitalis purpurea, are biennial woodland plants which produce thousands of small seeds from the capsules. The seeds require light for germination, so whilst it is a woodland plant, it will only establish new adult plants in gaps or clearings, and the foxglove life history is one of continual dispersal between different woodland gaps. Once a seed germinates, if it survives the stresses and strains of seedling life, it produces only a rosette of leaves in the first year of growth. 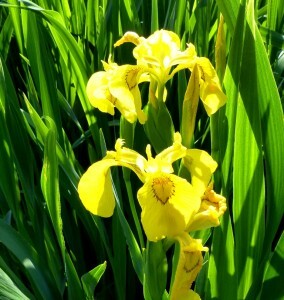 In the second year, leafy stems arise from the rosette from half a metre to over 2.5 metre tall with racemes of characteristic tubular flowers. The scientific name “Digitalis” literally means “finger-like” referring to the way you can fit the flower over your fingertip. Traditionally, Digitalis has been placed in the Figwort family, Scrophulariaceae, but the recent APG3 system puts it in a much enlarged Plantaginaceae. 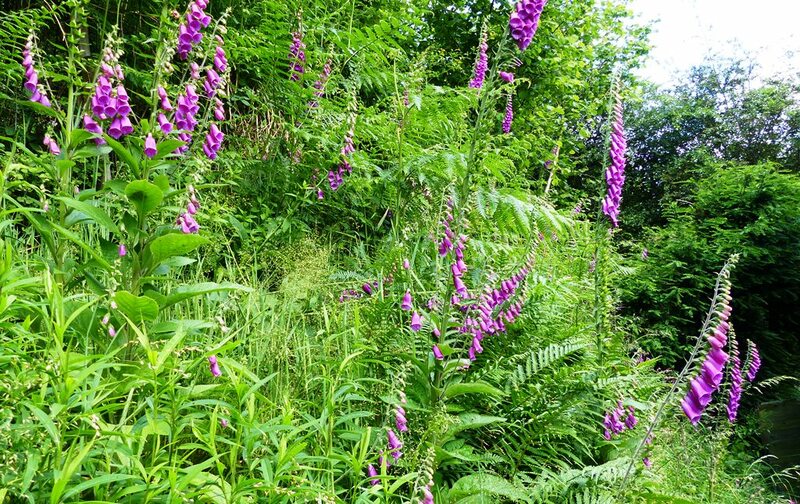 Foxgloves are poisonous but some of the plant compounds have medicinal uses in controlled quantities, e.g. digitalis is used for drug preparations that contain heart glycosides, e.g. digoxin derived from a number of species in the genus. This is only a fraction of the Digitalis story, so there’s really more to it than meets eye – and the finger! Day 17: OK, you guessed it, Dr M is in his garden again, this time, noticing the brambles growing ever more rampant, he approached with secateurs in hand, but what was that buzzing sound? 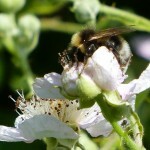 Getting closer he espied bumblebees flying hither and thither going wild collecting nectar from the abundant bramble flowers. 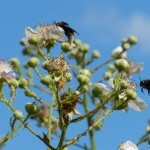 Certainly no need to trim back yet-a-while and why not wait and enjoy the fruits of the bramble later in the year?! Dr M says: what a great community is the Twittersphere! A bit of research shows these are real cuckoos, there are no workers, just males and females and the female Bombus vestalis are adapted to taking over nests of other species which have already been made and using the workers in these colonies to collect pollen. 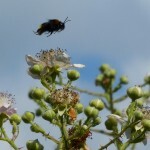 There are lots of cuckoo bumblebees, check more details here. Day 16: OK, so Dr M is back in his garden, but (as you will no doubt have gathered by now) Dr M is particularly fond of his garden! 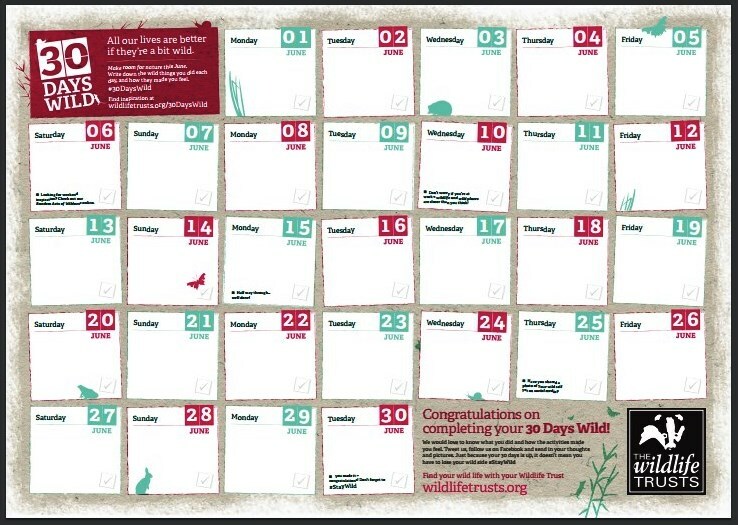 And to supplement the botanical wildness of the first half of his 30 days wild, the second half kicks off with zoological, and specifically, ornithological wildness – Red Kites circling above Dr M’s garden (will he feed them? no he won’t!). Once driven to extinction in England, Red Kites have made a spectacular come-back with the success of a reintroduction programme which started in the Chiltern Hills in 1989. 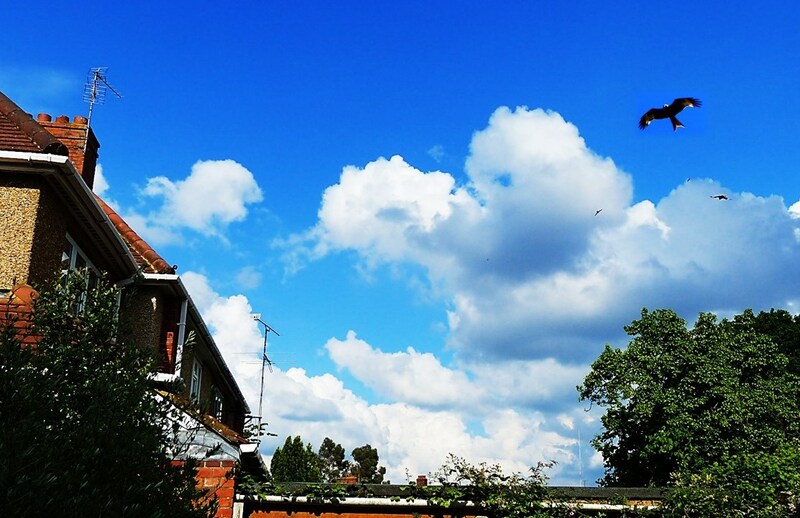 Red Kites have now become a frequent and familiar site as they circle above the town of Reading, and Dr Ms garden is no exception! Why has these reintroduction been so successful? Read here about research carried out by Mark Fellowes and Mel Orros at the University of Reading on the role of people, both in the previous decimation of this species (through persecution) and in the more recent resurgence of this charismatic bird (through supplementary feeding). What’s not to love about Red Kites? A great bird of prey and a conservation success if ever there was one? Day 15: Finds Dr M no longer in his garden! So where exactly is he? Well travelling for some survey work in the northern territories, and having a little time on his hands, Dr M decided to make detour to an area known as Cannock Chase by way of a botanical diversion. Cannock Chase is a farmer Royal Hunting Forest and was designated an Area of Outstanding Natural Beauty in 1958, and covering just 68 sq km, it is the smallest area so designated in mainland Britain. 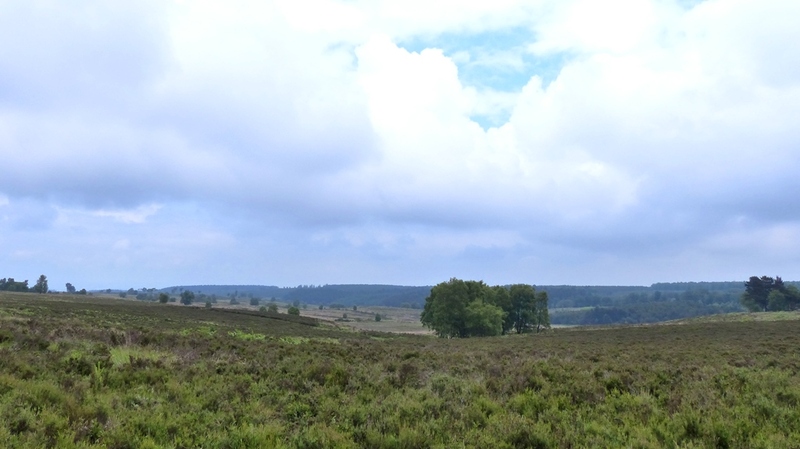 Cannock Chase is a small but diverse area including a mix of habitats: deciduous woodland, coniferous plantations, open heathland and the remains of early industry like coal mining. The typical flora includes woodland of oak, pine and birch trees with lots of bracken fern, with open heathland dominated by heather and bilberry. Botanically, the area is well known for the hybrid Cannock Chase berry (Vaccinium ×intermedium). In January 2009, an outbreak of the plant pathogen Phytophthora ramorum was discovered on the Chase. 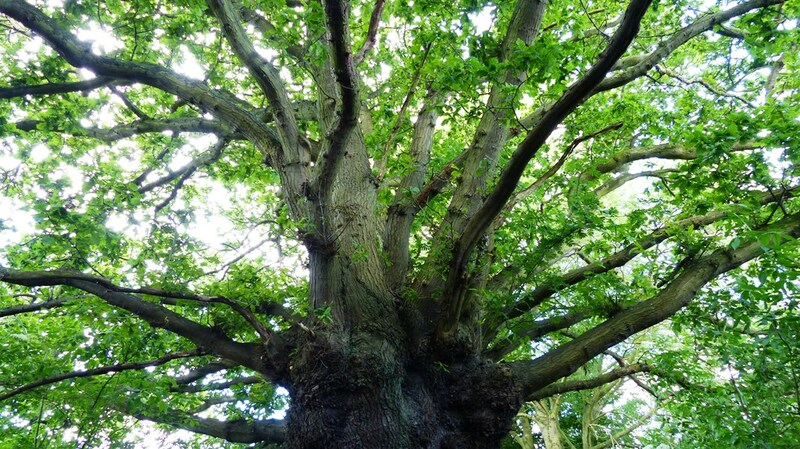 This pathogen is known to cause the disease known as sudden oak death, this disease affects oak and other woody species including Rhododendron. Day 14: Finds Dr M in his garden again (such a place of wildness he can hardly keep away!) this time gathering a couple of dozen or so common sedges from his bespoke collection – do we sense a sedge quiz in the offing? Well maybe, but these particular sedges are being collected and air dried and then stored carefully in large paper folders ready for Dr M’s botany classes on the University of Reading MSc Plant Diversity next term! 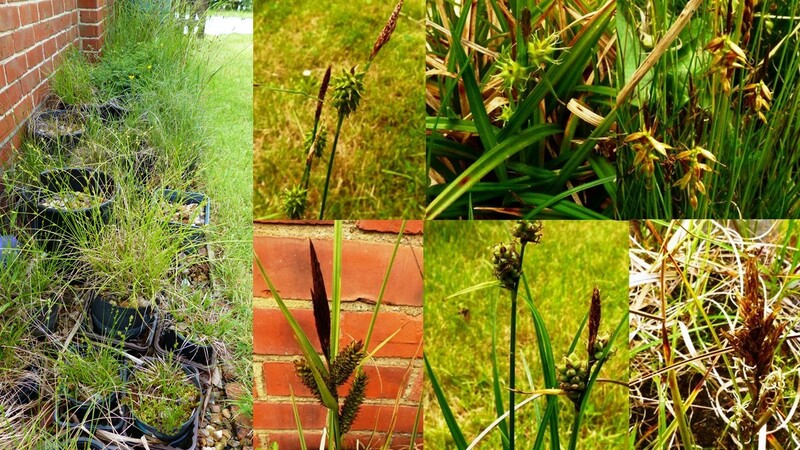 These sedges are flowering at the moment and in tip-top condition, but when Dr M comes to teach his students about sedges and their ID it will be autumn and in the wild (or Dr M’s garden) they will be well over and too bedraggled to be much use for teaching. Whereas Dr M’s dried collection will be (almost) as good as new and well fit for botanical education purposes! Little do his students know what joys lie in store for them! Dr M says: Come and join us! 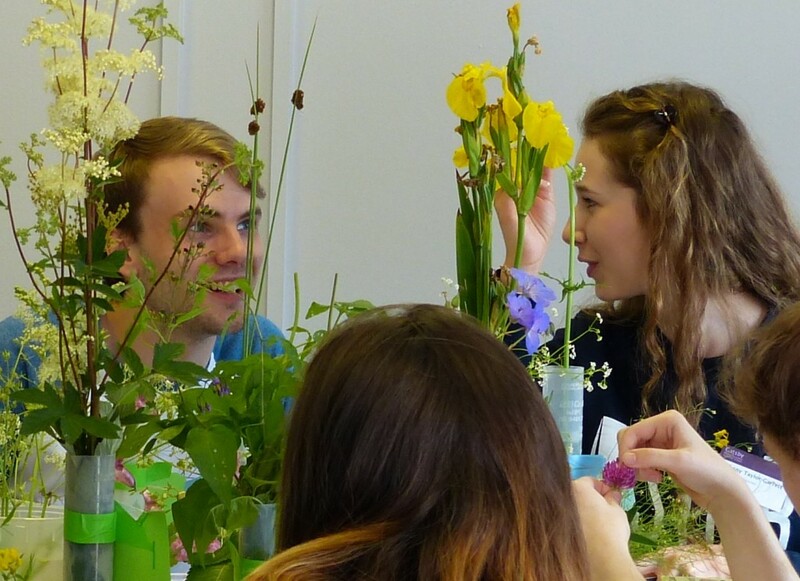 There is still time to register and be part of the next cohort of MSc students at Reading, gaining the field, lab and herbarium skills to equip you to join the next generation of plant diversity scientists (or just because you want to enrich your life botanically!). Did you know that the Reading MSc Plant Diversity MSc is the longest-running of its kind in the country (perhaps even the world) – we celebrate 50 glorious years in 2018! As a result of this long history there are Reading Plant Diversity alumni the word over in every conceivable botanical and plant diversity related profession! Check out the MSc here and get in touch! Dr M adds: but did you know there are crazy plans to “redevelop” this beautiful wildlife garden (i.e. bulldoze half of it) in some trendy new redevelopment scheme to get more people into the museum. There are plenty of sensible alternatives which guide folk through the garden and make it an an asset without trashing it! Check out the petition here, and help urge the NHM directors and the designers to see common sense and save the wild garden from being converted into a trendy urban theme park. Day 12: Dr M had plans for day 12 of his 30 Days Wild, maybe news of his fulfilling and productive day in his garden, maybe a pair of wood pigeons cavorting on the garden fence or Red Kites soaring in the blue sky, or a visit to the University of Reading Harris Garden Open day, but all were upstaged by this little cheeky little fella going wild in the University of Reading garbage bins! 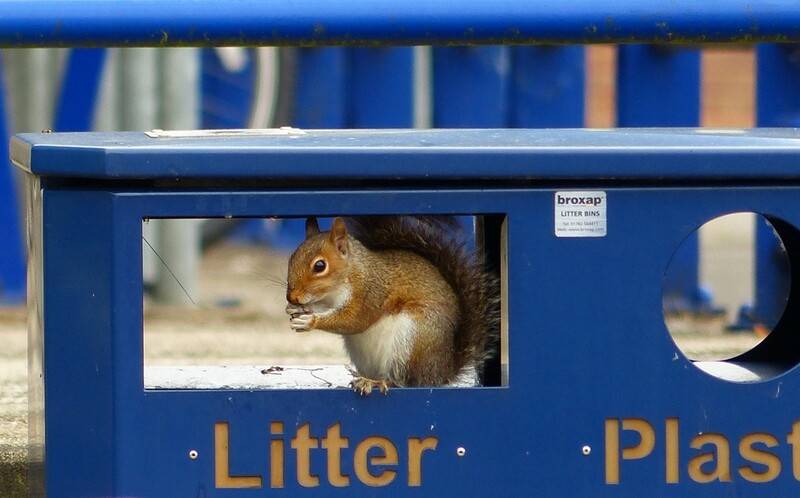 They don’t call him vermin for nothing, but you have to take your hat off to him and it’s not as if he was unobtrusive with his table manners, he was as noisy as hell! Day 11: Dr M finds it’s Saturday and time for some work in the garden! Weather just right, warm but cloud cover keeping the heat down. Between weeding and sorting collections of grasses and sedges (every garden should have them!) Dr M watched the Blackbirds feeding on the tiny black fruits of his Prunus incisa while the resident Robin practiced his circus acts on the wooden mobile! Radio 3 is never far away, and Dr M took some quiet minutes out to contemplate the music and adjacent sounds in and around the garden. Wildness and contemplation are the best of friends! 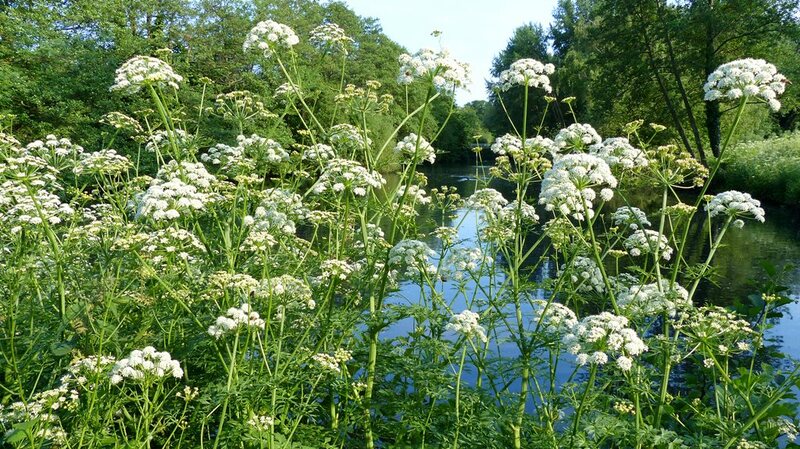 Day 10: So one third of the way through the month and @30dayswild finds Dr M admiring the wetlands on the University of Reading campus and this lovely Apiaceae, Oenanthe crocata (Hemlock Water Dropwort). 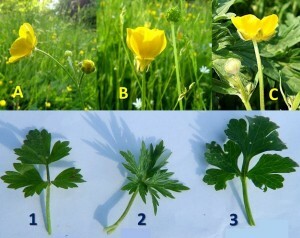 This plant is common in damp ground in swamps fens and by water. Several species in the genus are extremely poisonous, including especially Oenanthe crocata, which resembles celery or parsley and has roots like large white carrots or potatoes. It is the stems, and especially the roots, which are poisonous and livestock and human fatalities are well known. 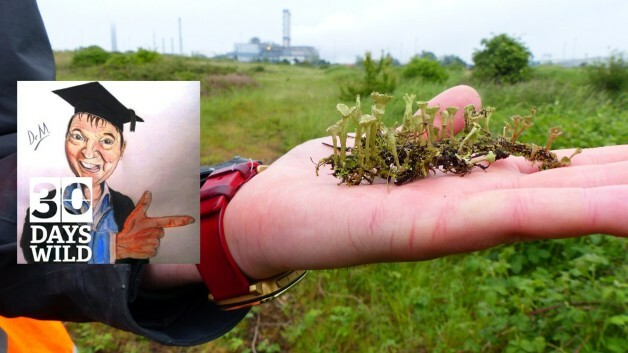 In fact, it has the dubious reputation of being the most toxic of all British plants perhaps especially as it looks rather like several edible plants. The message is simple: Oenanthe crocata makes you croak so learn some field botany and ID before you eat! 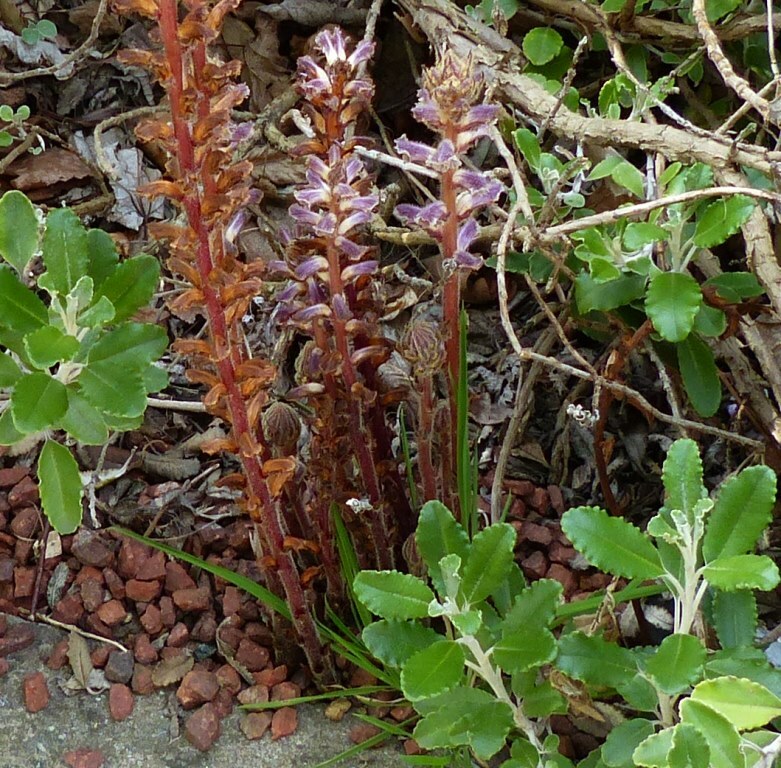 Day 9: Today Dr M stumbled upon this Broomrape going wild amongst planted mediterranean shrubs on the University of Reading campus! 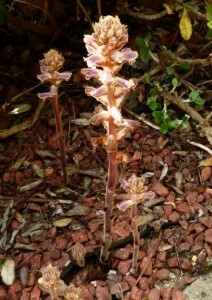 Broomrapes are parasitic plants that get all their food from whatever plant they are parastising. Broomrapes therefore do not need to photosynthesise and there are no green leaves and this adds a ghostly translucent appearance to the plant. The flowers are not brightly coloured, do not produce much nectar and most are unscented and do not seem to be visited much by insects. So how are they pollinated? Research (check it out here) suggests there can be occasional visits (and possible pollination) by bees and wasps and even pollen beetles. 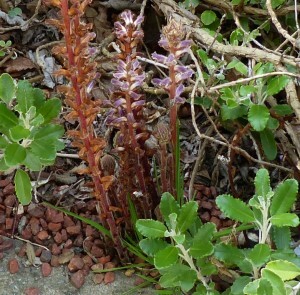 Some ants and other small insects also visit Broomrape flowers but are unlikely to have a role in pollination. Insects that visit the Orobanche host plants include a wide range of flies and hover flies, and these have a possible role as Orobanche pollinators as well. Detailed microscopic observations on the development of Orobanche flowers suggest that some species might self-pollinate hence n need for pollinators at all. Definitely a fascinating group of plants, and a group to go wild over! 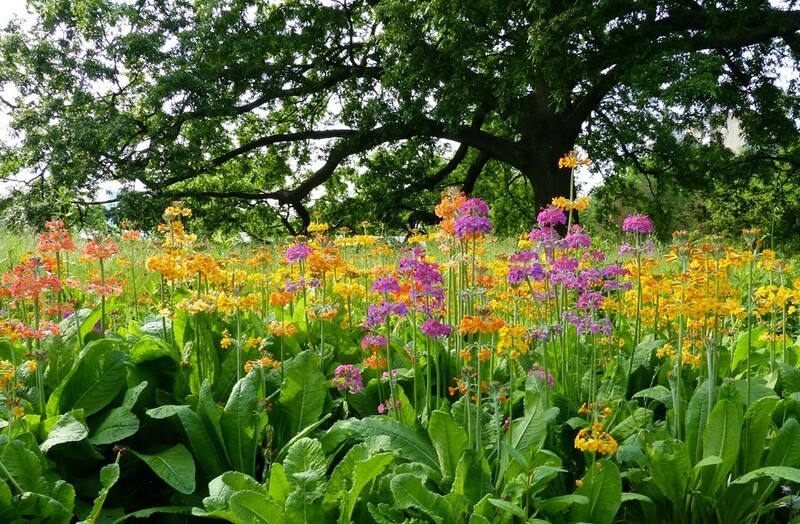 Day 8: Today finds Dr M’s going wild about these candelabra primulas alongside the stream in the University of Reading Harris Garden, the startling colour combinations surely come right out of a candy store! Day 7: Dr M is on the campus of University of Reading again, this time admiring the buttercups in the meadows. Can you tell the difference between our three common buttercups: Ranunculus acris (Meadow Buttercup), Ranunculus bulbosus (Bulbous Buttercup) and Ranunculus repens (Creeping Buttercup)? Day 6: Dr M still in the Harris Garden and going quite potty about Poaceae and all those spikelets strange yet magical, so much so he was moved to prepare a common grass quiz which can you find here. Day 5: Finds Dr M taking a late afternoon early evening constitutional through the Harris Garden of the University of Reading. It is a glorious botanical space and a wonderful communion of both wild and tamed plant species. Wandering past the stream which bisects the garden, Dr M chanced upon some fresh flowers of Yellow Iris (Iris pseudacorus). This beauteous vision quite site stopped Dr M in his tracks and set him thinking, could this be a candidate for the most beautiful flower EVER? Now Dr M is not really a one for “favourites” or “best in show” etc and for sure there’s plenty of competition in the global botanical world. But it has to be admitted, there is something about the monocotoledonous 3+3 symmetry, the patterned petal morphology and the Queen of yellows framed by the wondrous curvilinear architecture of the equitant leaves. Top of the floral league or not, certainty an awesome combination of controlled wildness! Day 4: Dr M in the garden sunshine once again, but not gardening, just pondering how much the lawn needs cutting! 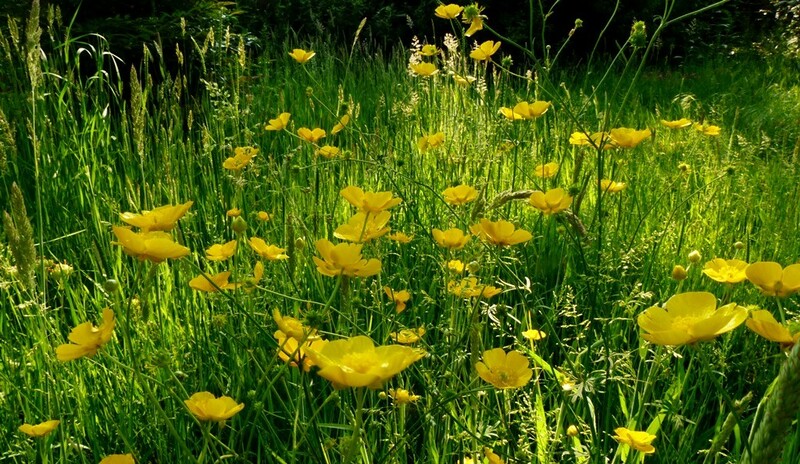 But how can he when the meadow buttercups and grasses look so fine, and plenty of food for the insects to enjoy! 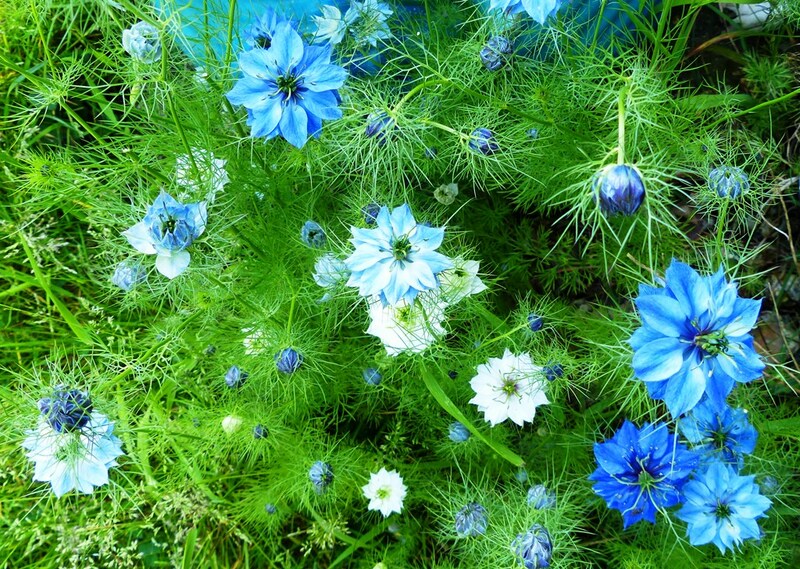 Day 3: The sunshine finds Dr M In his garden again, this time just admiring the self-set Love-in-a-Mist (Nigella damascena, Ranunculaceae) outside his back door! Day 2: Finds Dr M in his garden, outside the front door in fact, admiring a collection of wild plants in the plant pot, a couple of these came from seed collected during the Lizard field course last year, I wonder if you can identify them? OMH is a UK Biodiversity Action Plan Priority Habitat and a Habitat of Principal Importance under the NERC Act 2006. 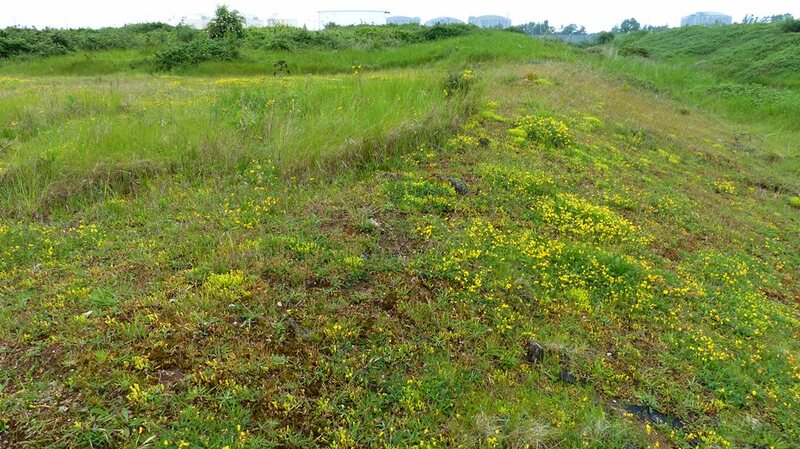 The Open Mosaic Habitat Inventory is the first national inventory of wildlife-rich brownfields, which distinguishes OMH from other brownfields or previously modified land. Thanks to the work of Natural England, ADAS and Buglife, amongst others, there is a detailed protocol for surveying and evaluating such sites, the best of which can be of great botanical and entomological diversity. Dr M says: The OED had better watch out, here comes the new active botanical verb: “To OMH”. School children the land over will recite after DrM: “I OMH, you OMH, he/she/it OMH’s, we OMH, they OMH”. And to establish the past tense, Julius Caesar would surely have relished: “I came, I saw, I OMH’d!